These however are not the earliest features as about 2 kilometres to the east lies what is thought to be a Neolithic tomb which predates any of the Bronze Age relics. The Whit Moor stone circle, like many other Dartmoor prehistoric remains, was in 1896 the subject of some restoration work by the Dartmoor Exploration Committee. Although they managed to resist the temptation to ‘explore’ the inside of the circle they did subject it to some ‘restoration’ work. This involved re-erecting five of the stones which over time had fallen down but to their credit still remain upright today. The modern ‘experience’ of the stone circle consists of 18 slabs, one of which is recumbent and another leaning perilously. It is possible that originally 19 stones made up the circle but the early examination by the D.E.C. found no evidence of a vacant socket hole. The stones of today range in size between 0.3m to 1.15m high and describe a circle of 20.2m across, (Butler, 1991, p.203). This would place the Whit Moor Stone circle 10th in the league of ‘who’s got the biggest diameter’ of the Dartmoor circles which sounds impressive except there are only 14 of them. But the tiny circle wins all hands down when it come to location altitude for at 437m it can claim to be the loftiest of them all. Associated with the stone circle is a cairn which lies about 90m to the south-south-east, this now vegetation covered mound measures around 8.5m across and shows signs of having been dug into at some point in history. View the ADS listing for the Whit Moor Stone Circle – HERE. In this north eastern sector of Dartmoor there is a cluster of 8 stone circles whose locations for a ‘sacred crescent‘ when plotted on the map and Scorhill sits in the middle of these. 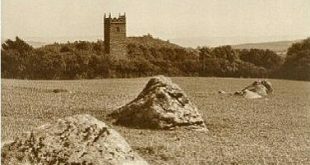 There is one theory that folklore can provide which explains the stone circle and that goes way back to the time when the Sabbath was regarded as a sacred day. There are those who will have you believe that one such Sunday a huntsman was out with his dogs when suddenly there came a load clap of thunder and a bright blue bolt of lightening shot down from heaven. Upon hitting the moor the huntsman and his dogs were immediately turned to stone as a punishment for breaking the Sabbath. It is said that on dark nights you can hear the dogs baying for release from their stony tombs. If you do a web search for the Whitmoor Stone circle you will find numerous entries on various ‘megalithic’ sites all bemoaning the fact of how hard it can be to get to. If you look at the above map you will see that to the north-east of the circle lies Raybarrow Pool, to the east is Whitemoor Marsh, to the south is Galleven Mire and to the north-west Taw Marsh. Pool, marsh and mire usually mean only one thing – wet feet at the best. One person actually complained that the, “footpath” on the OS map appeared to skirt Raybarrow Pool but actually the, “boggy area”, did not equate with the blue symbols on the OS map – oops, now there’s a thing, naughty, naughty OS. Personally speaking I would park on the ‘ring road’ follow the track down to Knack Ford then continue up the hill, head for Hound Tor and then cross to the circle – but that’s just me. “… which raises the unfortunate question whether, in its present position, it has not always been a bound-stone; if so it may possibly have been stolen from the stone circle … On the other hand the presence of that circle is favourable to the contrary view, that the stone is in its origin prehistoric and has been adopted as a boundary by a later race“. So, those are the opinions of what I would call past and present experts, the easiest way for deciding for yourself is to pay the stone a visit, just don’t go via Raybarrow Pool. Butler, J. 1993 Dartmoor Atlas of Antiquities – Vol. II, Devon Books, Exeter. Worth, R. H. 1988 Worth’s Dartmoor, David & Charles, Newton Abbot.